The Jassy-Kishinev Operation (Russian: Ясско-кишинёвская стратегическая наступательная операция, translation: Jassy-Kishinev Strategic Offensive Operation), named after the two major cities (Iaşi and Chişinău) that define its staging area, was a Soviet offensive against Axis forces, which took place in Eastern Romania during 20-29 August 1944. 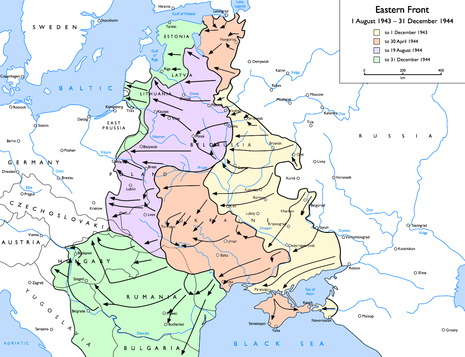 The 2nd and 3rd Ukrainian Fronts of the Red Army engaged Army Group South Ukraine, which consisted of combined German and Romanian formations, in an operation to reclaim the Moldavian SSR and destroy the Axis forces in the region, opening a way into Romania and the Balkans. 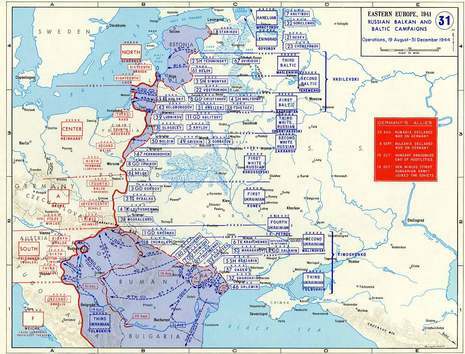 The offensive resulted in the encirclement and complete decimation of defending German forces, allowing the Soviet Army to resume its strategic advance further into Eastern Europe. It also forced Romania to switch allegiance from the Axis powers to the Soviet Union. As the war turned against Germany, and the Soviet Union began to run roughshod over Eastern Europe, Antonescu started looking west for allies to save it from Soviet occupation. At this stage, King Michael, son of the late King Carol, emerged from the shadows and had the pro-German Antonescu arrested, imploring Romanians, and loyal military men, to fight with, not against, the invading Soviets. The king would finally sign an armistice with the Allies and declare war against an already-dying Germany in 1944.